I am in the mud of my life, I work 2 hours part day makes me a small salary of 240 month share with a supplement CAF! 2. The mainstream media blackout: It is only necessary to go onto Gilets websites to witness the violence being metered out to the yellow vests. Does any of this appear in the mainstream media? Rumour has it a D notice has been issued in Britain forbidding any positive mention of the Yellow Vests. In France, it’s the same. Huge crowds in almost every main city are barely reported, grievances are never discussed. Many colour revolutions are staged by the MSM especially for audiences in Western Europe and the ‘first world’, as the current case of Venezuela illustrates. Instead of this colour revolution simulacrum, what confronts the Gilets Jaunes is a black-out. Draw your own conclusion. 3. The Red Scarfs: in themselves they are of little import, their numbers were exaggerated and being entirely a rent a crowd they lack stamina. On a deeper level however, the appearance of the Red Scarfs represents a very dangerous game by Macron. French society has long been susceptible to right-wing movements of violence: The 6th February 1934 crisis , the bloody war of the anti-Nazi resistance with Vichy militias, a conflict which many French view as a civil war and finally, the OAS in the early 1960s are all examples of such maneuverers. Traces of these historical moments are present currently in the rogue cops, the ‘Spéciale Castaner’ the militia recruited by Macron to dispense their special violence towards protestors. These ‘Des flic hors-la-loi’ (rogue cops) have appeared at every recent demonstration. Again, draw your own conclusions. Their presence shows the state’s desperation, the authenticity of the Gilets and their growing social power. 5. The manner in which the globalisers have no response but violence. What is occurring in France currently is a conflict between two world views that have nothing to say to each other. Something illustrated by the side-lining of both Maria La Pen and the official parliamentary opposition. Unlike colour revolutions, there is no clear officially endorsed alternative. No one in Washington nominated a Gilets for the presidency and if they had, no one would take any notice. Thus the ritualised nature of contemporary parliamentary politics has been starkly revealed; all the French deputies whatever their allegiance, are fully paid up globalising neo-liberals. It is clear that Macron has no way of speaking to the Gilets. His recent declaration that he too wanted a raise in salary (note the word salary) and that made him a Gilets too, is verging, in its relation to reality, on the clinically insane. Neo-liberalism is the world view of the elite and the powerful; as some have noted it’s a class war against the poor. All they can offer the Gilets Jaunes is the same old, same old. The elite’s incomprehension and isolation from the French people are clear in every word they utter. The Power is trapped in its own symbolic universe rendering them incapable of grasping the demands of lived experience expressed by the Gilets Jaunes. In this, the Macron Government resemble the Syrian Jihadists whose demands were incomprehensible to the vast majority of the Syrian people and as such could only be implemented by violence. 6. The confusion among intellectuals. The western intellectual tradition, particularly the social disciplines, has no idea how to address the economic, political and cultural stagnation currently affecting western countries. The continued prestige of the academy is more down to habit, careerism and State support than any lived engagement. Intellectuals such as Henri-Levy have been co-opted repeatedly to provide a veil of respectability for murderous foreign adventures in Syria, Venezuela and Libya. Simultaneously, academic opponents of these activities are being quietly silenced by purges and smears in universities in France, Australia and Britain. Moreover the concentration of French ‘intellectuals’, particularly social commentators, in the Paris, mirrors exactly the centralisation of political power, indeed they are so entwined one struggles to tell them apart. This is why, like the politicians, French intellectuals are resorting to scatter-gun accusations, chosen as if from some play-book; racism, populism, fascism, anti-Semitism, Russian interference and so on. Anything in truth they can muster at short notice for a two-minute sound bite. Needless to say, the Gilets Jaunes aren’t listening. There’s an old Sioux Lakota saying: a bird needs two wings to fly. So in globalised 20th-century politics the right-wing argues for economics, the Left speak of morality and in the end we have simultaneously a compassionate-bloodthirsty-anti-racist-anti-sexist-neo-liberal-green- modern and dynamic, latest operational whatever. Articles on the Gilets from a Leftist perspective are invariably varied in prescription and analysis and equally, invariably miss the point. Something always likely when moribund ideologues and their high priest caste are confronted with lived experience. 7. The disappearance of right-wing groups from the street: it is my contention, utterly unsupported by any concrete evidence I might add, that UKIP, Tommy Robinson, the EDF in Britain as well as One Nation in Australia and even Macon himself, are all creations of, and funded by, deep-state elements among the elite. There are also question marks of this sort over Antifa. The ex-Australian Prime Minister Tony Abbott admitted publicly that during his time as a Howard government minister he was literally the bag-man ferrying money back and forth to One Nation. Some of these groups listed above are violent; some are created with the intention of splitting the Labour vote. In any case, previously highly publicised right-wing groups have all but disappeared from weekly demonstrations, perhaps overwhelmed by the unfunded popular will. 9. The nightly MSM news is not crossing live to Washington for expert analysis. This is standard operational practice for colour revolutions in faraway places, mostly because the leaders of such coups often reside in DC on subsidies from the National Endowment for Democracy. Diversity is one of neo-Liberalism’s keywords, yet in thinking about such terms we should also recall Nietzsche’s axiom that things are only spoken about when they are disappearing. Here, however, in the Gilets, we have an example of true diversity, different in every way from the standard Neo-Liberal usage bombarding us every day. 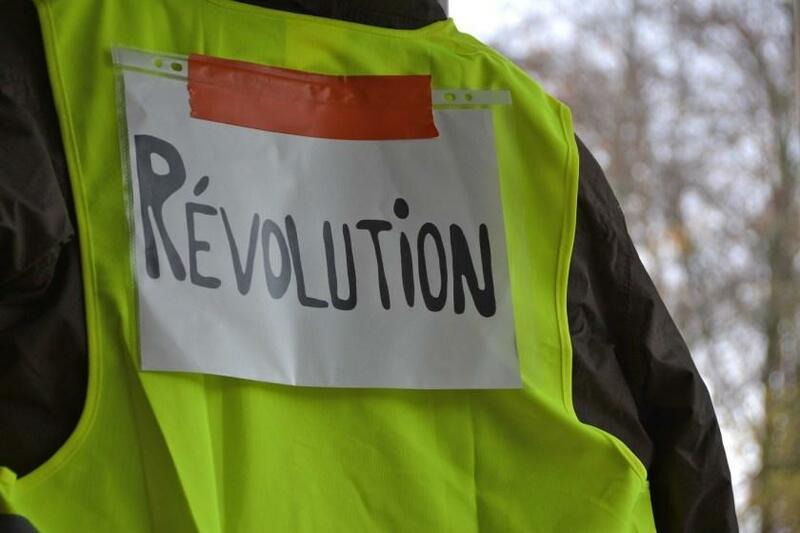 The fundamental reason the Gilets Jaunes differs from any colour revolution or indeed any major revolution of the 20th century is precisely the manner in which this alternative diversity functions. The Gilets are making their own meanings within their own spaces of appearance: ‘where they are seen by others as others are seen by them’ (Arendt 1958). And they are making it through discussion. Furthermore, these meanings are under their control and are held in common by the Giletswhatever their other differences. As the writer says “We’re all different with different ideas, but we have a common goal, We’re a lot then in a big family we fight but we meet every week”. This sociality creates meanings as an outcome of communal being-ness in common and these meanings remain under the control of the Gilets who made them. Differences, for instance over seeking election to the EU parliament, are simply tolerated. Diversity of response and opinion is seen as a strength, not a weakness. There is no ideological template applicable to every context. Instead, as an anonymous ex-French Intel guy said last week on Le Media, one roundabout is full of young people, another full of black bloc, another full of older people and they are all talking with each other. Through this sociality and commonality, meaning is produced and then held communally because participants inside varied and infinite contexts (spaces of appearance) and repeated actions of sociality act these meanings in common. Focus is centred on their common interest i.e. the impossibility of existing in today’s France. Everything else is fluff. Every week these participant meanings are sustained, built upon and maintained through more actions of sociality, more discussion and more actions. Communal meanings held and actioned in this way produce social power; because actioned meaning in common is precisely what social power is! Furthermore, this unity in diversity utterly splinters all the demonizing and pathologizing names invented by the media and globalisers over the last thirty years as a means of divide and rule. These devised names applied to groups in society: work-shy; dole-bludgers; terrorists; anti-Semite; Russian Bot; racist; sexist and any of the plethora of names applied by the state and the MSM towards elements threatening the façade of Neo-Liberalism, are simply bypassed. As in many other things the Gilets simply refuse to recognise them. I don’t know what the future holds but I do know that all these reasons taken together prove the Gilets Jaunes are the real deal for genuine change; not only in France but also in how the rest of the world conceives and practices politics itself.